Kakanin, or Filipino native delicacies, are snacks usually made with or containing any or combination of coconut milk, rice flour, glutinous rice, cassava and sugar. Kakanin are usually prepared whenever there is a special occasion like fiesta, birthday, Christmas, anniversary or just enjoy a fun afternoon kakanin snack party with your family and friends. This Cassava recipe Filipino style is one of the most popular and enjoyed delicacies or Kakanin. 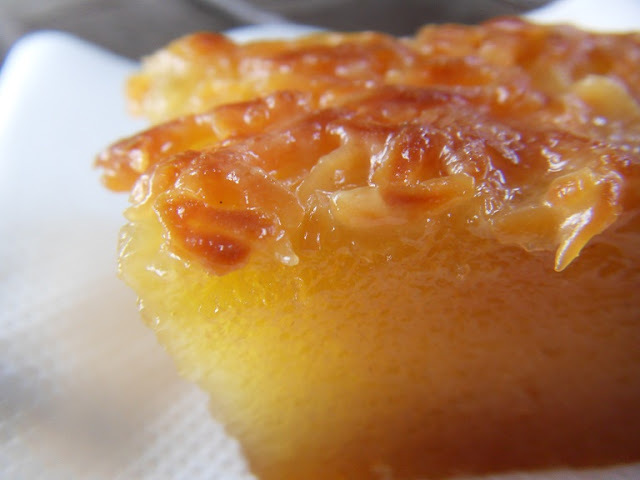 Cassava cake is made from grated cassava or manioc, a woody shrub where the starch that is used to make tapioca are derived. 1. In a large mixing bowl combine all Cassava Cake ingredients; mix thoroughly until even in consistency. 2. Pour cassava mix in a greased baking tray, spread macapuno on top then bake in a 180C preheated oven for 45 minutes. 3. While baking in a sauce pan mix together topping ingredients, mix thoroughly until even in consistency. Cook in low heat until sauce thickens.